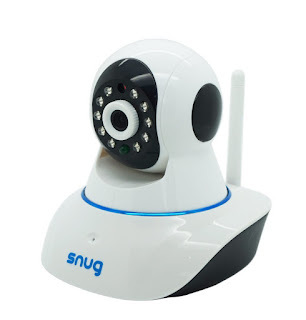 You can easily connect this video baby monitor securely to your home Wifi network and smartphone in under 10 minutes. First, connect the camera to a power supply and your home router. Second, download the free App for your device. Then tap "Add Device" and enter the camera ID (located on the bottom of the camera) into the app, and press "Finish". That's it! You can then unplug the camera and move it anywhere in the house. A more detailed set of instructions is included with the packaging. I am big about thinking outside the box and this is not used in our house for its original means. It comes with an attachment that allows you to set up the camera. I use it pointing at the mail box to catch anyone stealing from our front porch. So basically I re purposed it as a security camera. I love that it has a spot for a media card so I can review the footage later and not having to watch the camera at all times. The app was easy to set up although the QR code scan didn't work for me and I had to manually type in the code. I was amazed by the range of movement of the camera and how easy it is to control from the cell phone. I have used it with my iphone 6s plus with and without wifi without any issue. The app allows for multiple camera access which makes me want to get a 2nd to monitor the back of the house. Oh and I almost forgot to mention it has night vision!!!!! I will finally find out who is stealing my packages and breaking into my cars.